There are certain crafts that require an artisanal touch and an experienced set of skills. In our "Meet the Maker" series, we dive into the worlds of Arizona's most skilled culinary artisans. This article takes us to Buckeye to meet Wendell Crow of Crow's Dairy. When Wendell Crow finds out we're featuring him in our Meet the Maker series, his face breaks into a smile as broad as the nearby Gila River. "Well," he says, "you've come to the right place. I'm the cheese maker." Let's be specific. Wendell is a goat cheese maker. He and his wife Rhonda run a five-acre Grade A farmstead dairy on the outskirts of Phoenix in Buckeye. The farm is home to 300 Anglo-Nubian goats that produce enough artisan cheese to service 110 restaurants and a handful of retail outlets, including dozens of farmers' markets, around Arizona. These goats are busy. As such, so is Wendell. 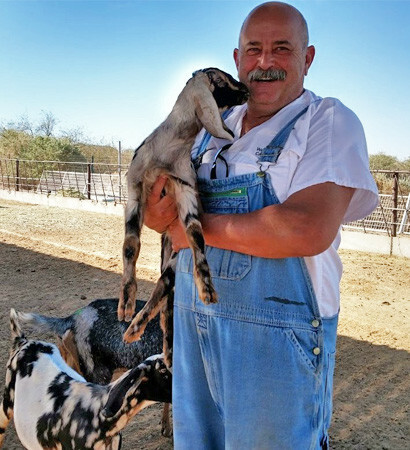 For decades, high school sweethearts Wendell and Rhonda were cattle dairy farmers in Tolleson, Arizona, but 10 years ago, they "converted" to goats and never looked back. Wendell admits that Rhonda was the enthusiastic one. He says it took some convincing to persuade him to follow the goat path, and that, in truth, he wasn't always a fan of goat cheese. "In 2006 we sold off our cow business and took a two-year cheese vacation," Wendell explains. "Before we took the trip my wife said 'let's do goats.' I said there was no way I was getting into that. I had tasted two kinds of goat cheeses that were just terrible." However, on their vacation, they met goat-cheese makers who, in Wendell's words, "knew how to do it right." "It was a completely different taste – like day and night," he says. His mind was made up. He and Rhonda were going to start a dairy farm with goats. Crow's Dairy sits south of Buckeye, just across the Gila River. Because goats tend to be high-strung animals that scare easily, the farm's remote location—even at the edge of a city of 4.5 million people, there's not a soul around—is ideal for the animals. When Wendell bought the land that is now Crow's Dairy, it was a rundown cow farm. Now it's a thriving farmstead dairy of Nubian goats. Nubian goat milk is extremely rich, averaging 5 percent butterfat, which makes for tasty cheese. Wendell loves it here, and it seems so do his 300 happy and healthy goats. All of the kids are raised by their mothers until weaned, and while the farm isn't certified organic, Wendell does everything he can to meet similar requirements. Out in the yard, the license plate on his delivery van reads "EATCROW." The goats see Wendell standing by the fence and wander over, seemingly to say hello. Each one has its own name. "About 40 percent of these goats think they're my best friend," says Wendell. The goats eat mostly barley and molasses, and they have access to alfalfa and seasonal oat hay. Plus, they enjoy treats of mesquite and eucalyptus branches. Twice a day, they trot obediently into the milking station. Most of Wendell's time is spent in his cheese room, where he has refrigerators to keep the chevre and milk fresh. There are also pasteurizers and walk-in fridges filled with tubs of feta, buttermilk, and quark (a style of cheese similar to cottage cheese). 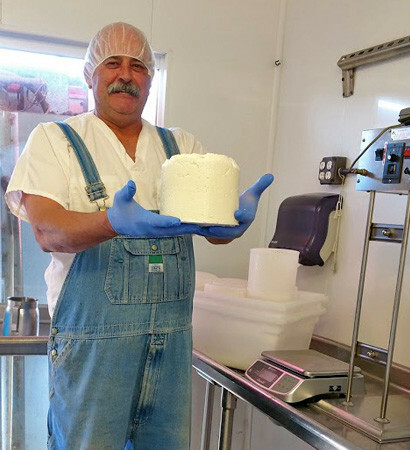 "We make about 120 pounds of cheese on a daily basis," Wendell says. "We are very busy throughout the winter, but the hardest part of [making goat cheese] in Arizona is the summer. You hope you've made enough money in the winter to get through the summer. We make a lot of feta in the summer." "The better the milk, the better the cheese." Crow's Dairy entirely manages their own milk supply, unlike large dairies that produce cheese from milk sourced from multiple places, sometimes from as many as 350 other dairies. "Our milk is the best you can get," Wendell says. "It doesn't come from anybody else. When you're putting your own name on something, you make sure it's right every time." The sheer number of restaurants—more than 100 in Arizona—that use Crow's Dairy products is a testament to the company's high-quality cheeses. Among the big-name local restaurants that prominently feature Wendell's cheese on their menus are FnB in Scottsdale and Lon's at the Hermosa Inn in Paradise Valley. "We started small with a couple of high-end restaurants picking up our stuff. Then our reputation really spread, and now word-of-mouth has been our main sale. We've never even advertised once." Wendell is quick to point out that the artisan-cheese world isn't all glitz and glamour. "I always maintain that the secret to goat cheese making is 10 percent science, 10 percent art and 80 percent dishes. I wash so many dishes." You can find Crow's Dairy products at Whole Foods, area farmers' markets (Uptown Farmers Market in Central Phoenix, Tempe Farmers Market, and Momma's Organic Market in Peoria), as well as on the menus of many of the best restaurants in Arizona. The farm isn't open to the public, but you can purchase goods directly from Wendell. Call ahead to make an appointment. Kevin Binkley, Nobuo Fukuda, Caleb Schiff, and several other Arizona chefs and growers give us a peek inside their personal refrigerators. 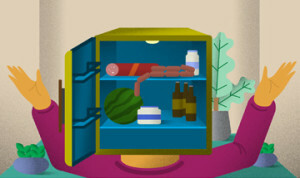 Ever wonder what chefs keep in their refrigerators at home? This is your chance to find out. Arizona’s culinary bigshots take us behind the doors of their fridges. In our “Meet the Maker” series, we dive into the worlds of Arizona's most skilled culinary artisans. 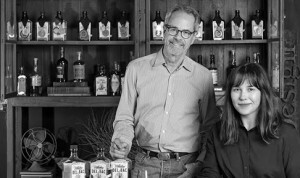 This article takes us to Tucson to meet Stephen Paul of Hamilton Distillers.